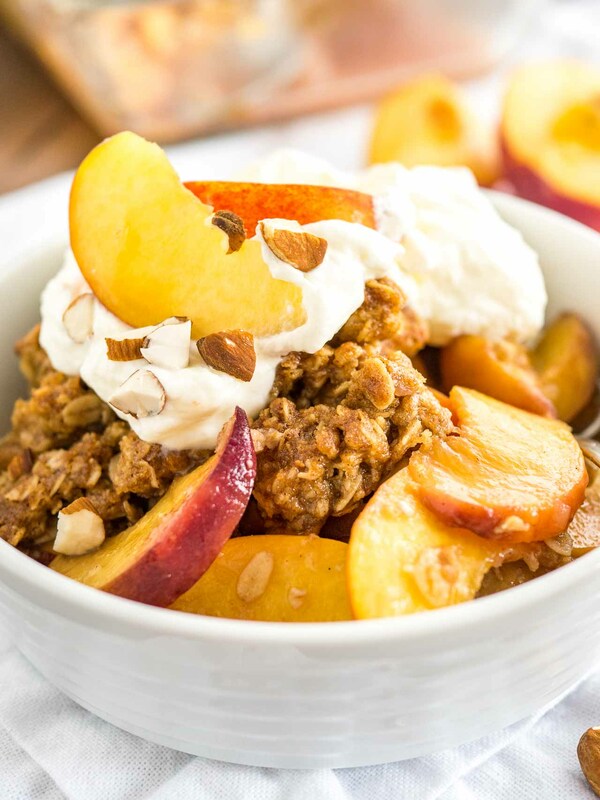 Peach Crisp is made with fresh peaches and topped with a crunchy oatmeal brown sugar streusel! This easy summer dessert is the ultimate comfort food. 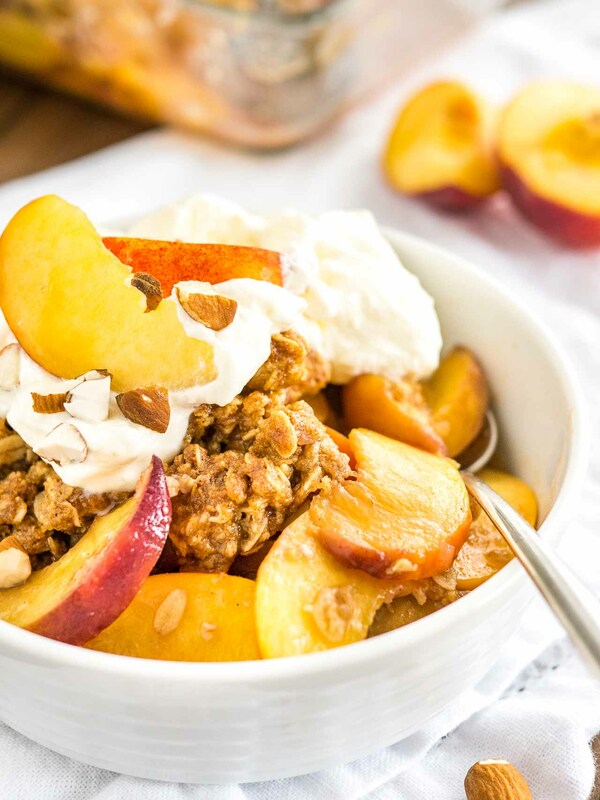 Peach Crisp with fresh peaches topped with a big scoop of vanilla ice cream is the perfect summer dessert! This easy dessert will be a hit at your next summer party or BBQ. I love the combination of juicy fruit, crispy brown sugar oatmeal streusel, and cold ice cream – SO DELICIOUS! 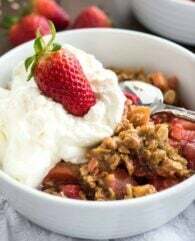 A few weeks ago I shared the recipe for this easy Strawberry Rhubarb Crisp which is perfect for late spring and early summer when rhubarb is in season. 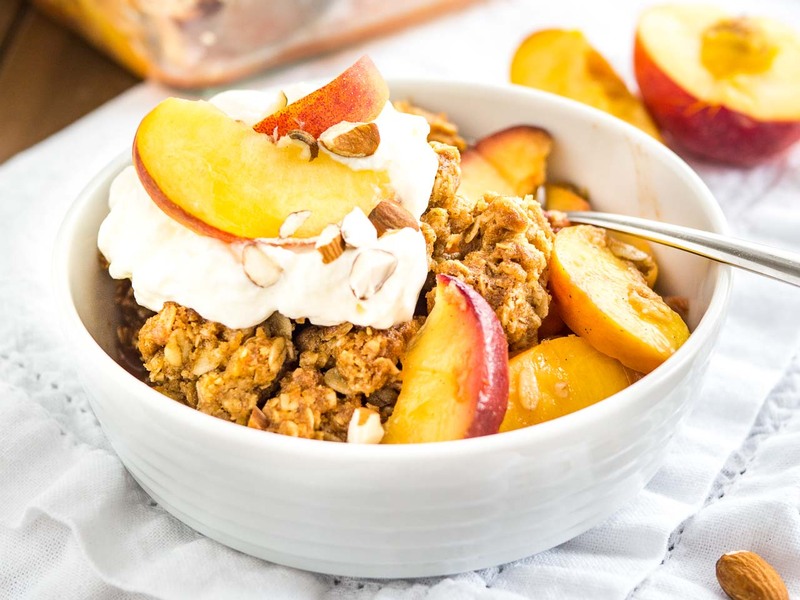 But when summer really arrives and you can get perfectly ripe and juicy peaches at the farmers market it’s time for this Fresh Peach Crisp! 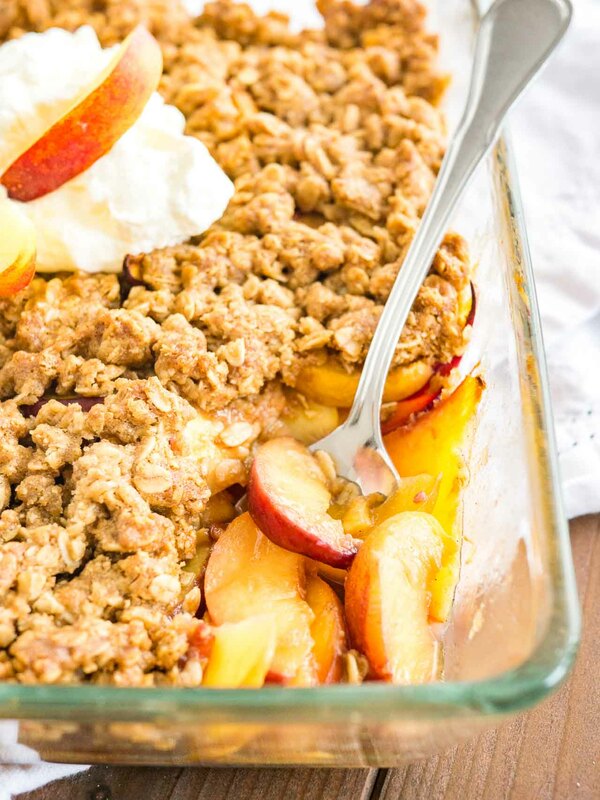 This peach crisp is super easy to make from scratch! No need to peel the peaches if you like a bit of texture in your crisp like I do. The brown sugar oatmeal streusel is so crispy and tasty but super easy to whip up. A perfect easy summer dessert that everyone in my family loves! 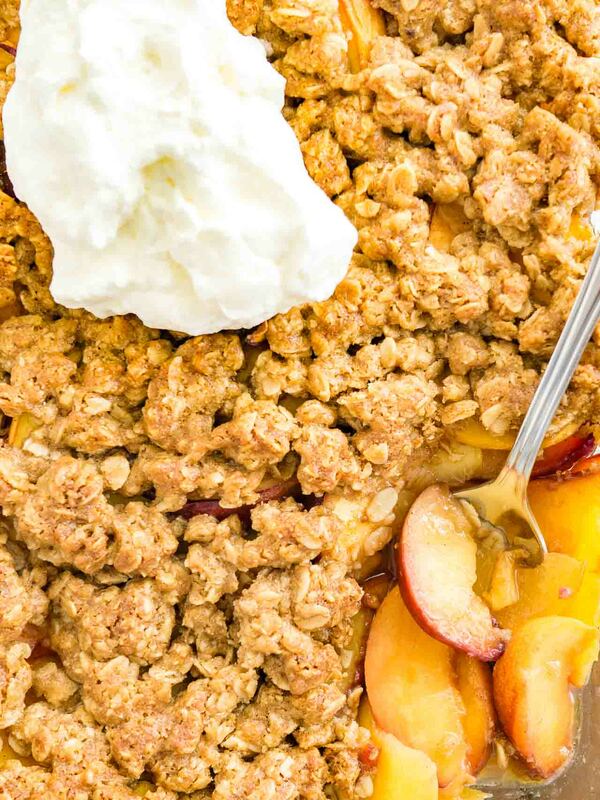 The secret to a great peach crisp is to use perfectly ripe and juicy peaches. 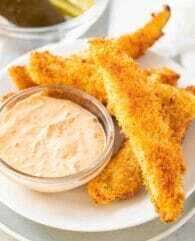 If you can’t get your hands on ripe peaches you can use canned peaches for this recipes. Drain them before adding them! I don’t peel the peaches but you can definitely do that if you don’t like it. Don’t skip the old-fashioned oats! They make the topping crispy and give you a nice crunch. If you use a shallow baking dish place it on top of a foil-lined baking sheet to catch any spills. This makes cleaning up easier! This recipe works best in a 9-inch round or square or similar sized baking dish. Whipped cream or vanilla ice cream would pair perfectly with this crisp. The warm juicy fruit, crunchy streusel, and cold ice cream are the perfect combo. So EASY and DELICIOUS! 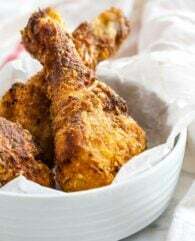 Check out my Summer Recipes Category for more delicious recipes for the warmer months. 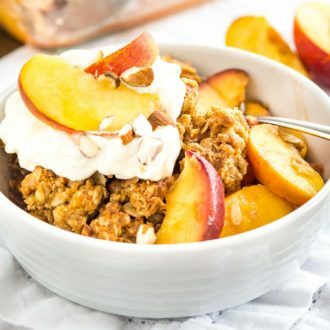 I like to add Almond Extract to my peach crisp because the flavors go so well together. I’m all about this cast iron skillet. It has the perfect size to use it as a baking dish for crisps, skillet cookies, or vegetable side dishes and it also looks great as a serving dish. 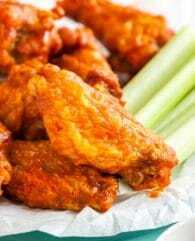 Preheat the oven to 350°F (180°C) and grease a 9-inch square or similar sized baking dish. 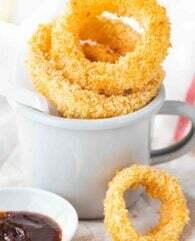 In a large bowl, combine cornstarch and sugars. Add peach slices, vanilla extract, lemon juice, and almond extract. Toss to coat. In a medium bowl, combine the old-fashioned oats, brown sugar, butter, flour, cinnamon, and salt. Mix the ingredients together until large cookie dough like crumbs form. 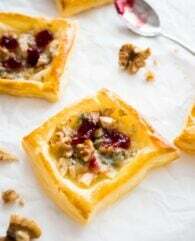 Drop small pieces of the topping evenly over the filling until you used all of the topping. 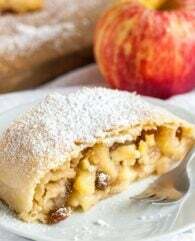 Bake at 350°F for 45 minutes, until the fruit filling is bubbling and the topping is nicely browned. Let the crisp rest for about 10 minutes before serving. Serve warm with ice cream or whipped cream if desired. Pretty good recipe. Followed it as stated. Crisp topping was good. If the peaches are juicy you will need a little more cornstarch to tighten up juice. Good flavor and not too sweet. If I make this again I will use half the butter. Great flavor but the crisp part turned out liquidy. Fresh peaches all the way! 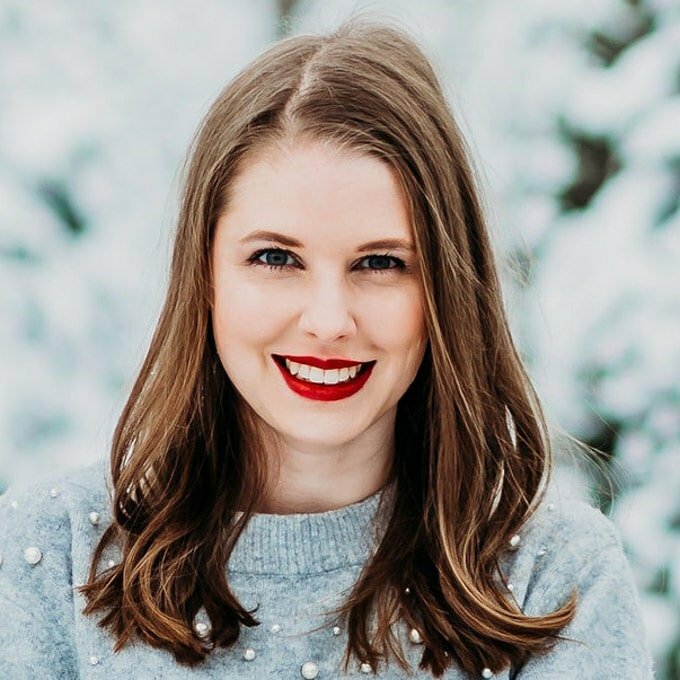 This cobbler looks perfect for summer! This looks so refreshing and delicious! Perfect for summer!